Randi (The Muffin Lady), a reputed High Altitude Food Specialist, welcomes you to her web site where you will find her guidance for baking and cooking scrumptious, everyday treats and foods in higher elevations and sample her delicious recipes, too. Randi shares her 35 years of experience baking at high altitude for all to enjoy; including those with special dietary concerns. Received a Best First Cookbook Award and an honorary mention as One of the BEST of the BEST Cookbooks from Gourmand’s World Cookbook Awards. Received an Honorable Mention at the New England Book Festival. Approximately 150 original Recipes ranging from cookies and cakes to strudels and much more! 280 pages with full color photos. Special dietary adjustments, ingredient substitutions and equivalents. “One of the best in this niche area of baking. Destined to become another world award winner! New and seasoned moms, family members, neighbors, newlyweds, new home owners, graduates, teachers and more will enjoy and appreciate this cookbook as a gift! Enjoy Early Morning Risers to What’s For Dinner and more. 400 + pages of proven recipes and color photos. 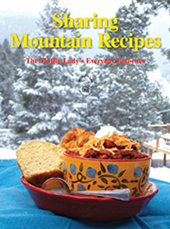 Click here to read a rave review by Cherie Fisher for Reader Views of Sharing Mountain Recipes. Sharing Mountain Recipes: The Muffin Lady’s Everyday Favorites by Randi Levin (aka The Muffin Lady) showcases a compendium of nutritious, delicious, and thoroughly ‘kitchen cook friendly’ recipes of easily prepared dishes ranging from breakfast favorites to special occasion treats. Ingredient supplements for special dietary needs are provided in addition to diverse tips for cooking and backing that will prove especially helpful for the novice chef. With recipes ranging from Dreamy Cheese Mashed Potatoes; Lemon Poppy Muffins; Berry Baked French Toast; and Sunshine Salad; to Sweet Poultry Kabobs; Seafood Au Gratin; Fried Bananas; Butter Cream filled Coffeecake. Of special note is the two pages devoted to ‘A Few Favorite Submarine Sandwiches”, the chapter on ‘The Accessories of Foods’, and unique recipe cited as being ‘The Gourmet Mash for the Elder Horse’. There’s even a poem to ‘The Alligator Pear’. 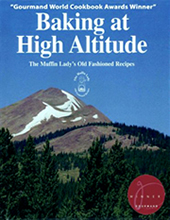 Enhanced with a ‘Cooking Language Conversions’ page, a U.S. to Metric Conversions chart, an a detailed index, Sharing Mountain Recipes is a welcome and recommended addition to any and all personal, professional, and community library cookbook collections! But wait! This gets even better! families healthful tasty foods with affordable easy. avoiding childhood obesity at home with ease! “Randi Levin’s latest and greatest cookbook Love More Feed Less is full of tips, recipes and insight that all will benefit from! Whether you are feeding a family with kids or simply looking for healthy eating tips for yourself, this cookbook is a must have! From childhood obesity, to disease prevention, to the pitfalls of the life filled with hectic schedules and the fast food diet, each of us can find quick, easy and healthy recipes in Levin’s winning book Love More Feed Less. Levin provides multiple recipes that are nutritious and filling. She goes further by providing variations to accommodate various tastes, likes and allergies. Get your copy of Love More Feed Less today and start making yummy delights like Green Eggs & Ham, Jiffy Chicken Stir, True Blue Muffins and more! “This book is written and presented in such a way that anyone would value from its content; the starving student, busy parents, bachelor’s and more! Get a copy for yourself and a friend today! The recipes are easy and the book contains both an index and section for ‘Substitutions and Equivalents’. As Levin points out, cooking and eating at home can save money AND save you and your loved ones health! What’s not to love?